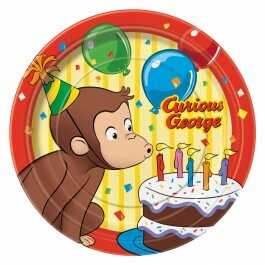 Celebrate your child's curiosity, adventurous spirit, and love of this little monkey with a Curious George birthday party. 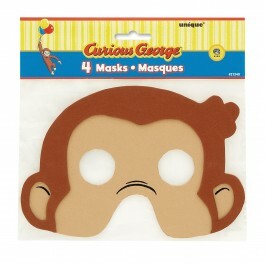 A Curious George birthday celebration is sure to be a lot of fun for kids and grownups alike! There is no greater place to host a Curious George birthday party than your local zoo. Make a few inquiries as to what kind of birthday packages they offer, and be sure to find out if there are any discounts for larger groups. Start working on plans for the Curious George party at least six weeks in advance of your preferred party date, especially if you plan on hosting it at a venue other than your home. Party slots can fill up rapidly, so it is important to plan well in advance in order to secure your reservation. If you will be hosting the Curious George birthday party at home, consider looking into having a petting zoo visit your home for an hour or two during the party. Many will bring small and very docile animals, and may even include a calm monkey for the kids to meet. Be certain that you order your Curious George party supplies in India with a minimum of four weeks before the date of the party. Not only does this give you plenty of time to ensure that your supplies are in hand on the date of the party, but it will also give you lots of time to send out the Curious George invitations to your guests. 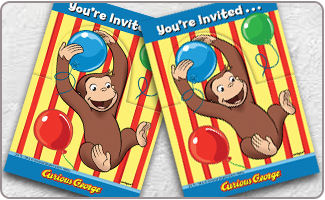 With some bright yellow cardstock or postcards, you can create adorable Curious George themed invitations. Print the party details directly onto the invitations, and use Curious George stickers or die-cuts to design a truly unique and personalized invitation. A nice simple design for your Curious George invitations is to cut out party hats, using yellow construction paper. 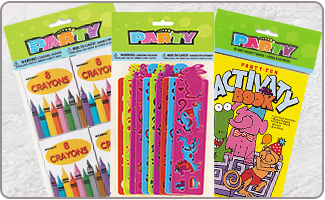 Write the party details on the party hat and assemble, using glue to hold them together. With some die-cuts themed to Curious George, you'll have cute and functional invitations that are perfect for hand-delivery. 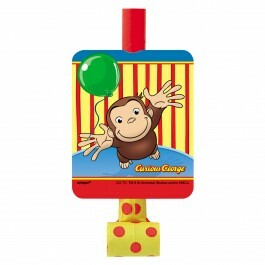 A banana shaped invitation is just what the monkey ordered for this Curious George party. 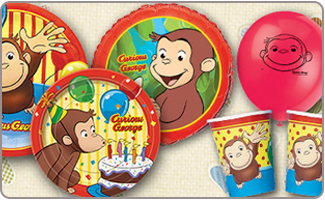 Use clever wording like "Let's all go bananas at Sally's Curious George party!" Attach a plush monkey to each invitation, with a piece of red ribbon. Curious George loves cookies and sweets, so a little bag of sweet monkey treats would go nicely with the invitations, especially if they are being hand-delivered. Some banana shaped and flavored candy Runts would be ideal! 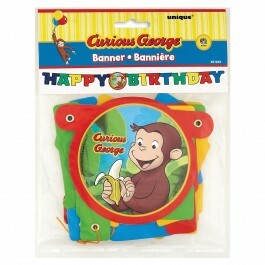 Pick from mybirthdaysupplies some prepackaged Curious George invitations from our selection. They will save you time as you prep for the party, and will be an adorable way to introduce your guests to the party theme. Pin the hat on the Man with the Yellow Hat is a fun twist on the pin the tail on the donkey party classic. Use Velcro or double-sided tape so that no one gets stuck by a push pin! A cloth or plush banana is the perfect tool for Cold Banana, which is a spin on the party classic of hot potato. You could use a real banana for the game, but it will likely wind up a bruised and sticky mess by the end of the game. Kids of all ages love a treasure hunt, which makes it a great choice for a Curious George birthday party. Hide plastic bananas, monkeys, and yellow hats around as clues, all leading towards the treasure. The treasure could be some of George's favorite things, which are coloring books, crayons, plush animals, chocolate coins, and of course bananas. The Man with the Yellow Hat goes on safaris, which makes a backyard safari a super fun choice for this party. Use posters of wild animals, along with plush versions of favorite wild animals, and have your very own safari. Be sure to wear a Yellow Hat, as the leader of the safari. 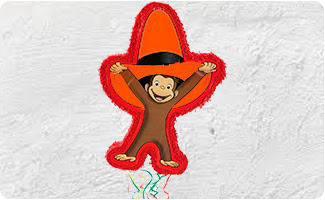 Using brown felt or construction paper, make enough "monkey tails" for all of the party guests to wear. Put on some wild and fun music and play a game of monkey dance! The little monkey who is still wiggling when the music stops is out for the round, until the winner monkey is left to win a prize of banana candy or chocolate gold coins. A face painter is always a hit with kids, especially when they get to paint their faces just like their favorite little curious monkey. 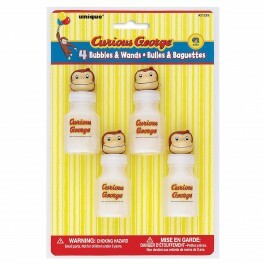 Curious George sticker sheets, coloring books, and crayons are delightful and colorful party favor choices. A plush monkey, along with some candy bananas are just what every little party guest will enjoy. Play-Doh in some bright colors, along with a Curious George book or DVD will inspire creativity and offer entertainment. 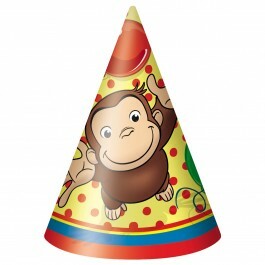 Party hats, blow outs, straws, and other Curious George return gifts are a grand way to thank guests for celebrating with you. 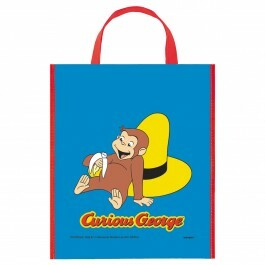 Check out our collection of curious George return gifts in India. Binoculars, safari hats, plastic wild animals, and other goodies related to going on safari in Africa are a surefire hit. Fruit is a must-have for any Curious George birthday party, so be sure that there are lots of apple slices, orange segments, and of course bananas! Slice up bananas and dip them in yogurt or chocolate for an extra sweet treat. 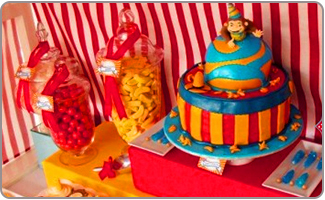 A bowl filled with yellow candy is sure to bring a smile to the faces of the little monkey party guests. There are several options available so pick out a good selection and be sure to label them on the party table. 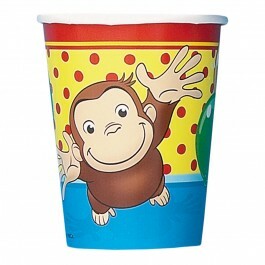 Banana smoothies or milkshakes, with some mini chocolate chips in them, are the ideal beverage for a Curious George birthday celebration. If you'd prefer to stick to juice, then banana juice is available in the juice aisle of most grocery stores. A banana flavored birthday cake is sure to be a tasty hit with all the guests. 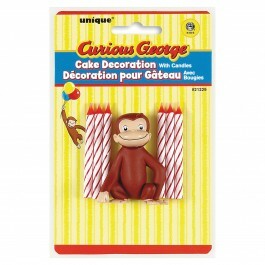 Decorate the cake using some adorable Curious George cake toppers and even a George candle! Cupcakes and cake pops are always a sweet treat enjoyed by all. Make them using a banana cake recipe and consider frosting them with chocolate fudge frosting. Decorate the cupcakes with cake toppers or in bright yellows and reds. Banana pudding is sure to go down well at any Curious George birthday party. Use ramekins to make individual sized portions, or use silicon cupcake molds instead. Think about having a banana split bar, for older children and their parents in attendance. This will allow everyone to get exactly what they want with their ice cream! Balloons are a must have for this wild monkey party! Get a Curious George shaped foil balloon, and add lots of bright yellow, red, and blue balloons to create a truly festive vibe to the party space. Decorate the party zone with yellow, red, and blue streamers, along with a nice Happy Birthday party banner that will help you celebrate in style. Using some posters, construction paper, and a bit of creativity, you could design a life-size George stand-up with the face cut out of it. Party guests can then pose for pictures that can be printed out and sent to them along with thank-you notes after the party. Sombreros are really affordable from most party supply stores or budget craft stores. With a bit of yellow spray paint you can transform them into Yellow Hats and attach them to walls, ceilings, or use them to place food containers into on the party table. George is often pictured with a brightly colored beach ball, so a few of these inflated and placed around the party spot will be a lot of fun. 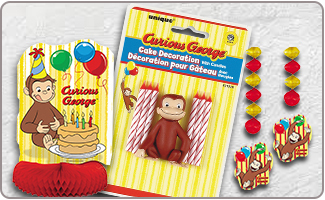 Decorate the party table with some of our great Curious George party supplies that will give you the ideal options for table coverings, plates, napkins, straws, cups and so much more. If the party supplies are a bit too busy for your personal tastes, then use solid colors in blue, red, and yellow to break up the patterns a bit.